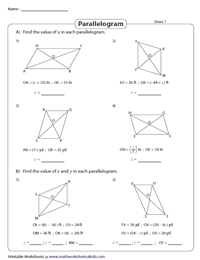 Walk through a multitude of parallelogram worksheets, meticulously drafted for students of grade 3 through grade 8. Learn the basic properties of a parallelogram using the charts, identify parallelograms with and without measures, find the missing measures, determine the area and perimeter of parallelograms as well. Additionally, find exercises involving algebra in parallelograms and much more. Memorize this set of properties of parallelograms charts to swiftly solve problems involving parallelogram. Associated here are three properties of parallelograms charts with sides, diagonals and angles. Observe each quadrilateral keenly, conclude which of them are parallelograms and label them accordingly. Part A provides measures of sides and angles, while congruent parts are indicated in Part B. 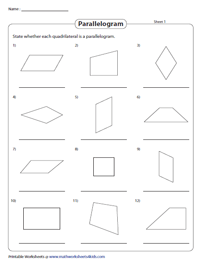 State whether the quadrilaterals featured in this batch of third and fourth grade worksheets are parallelograms or not. 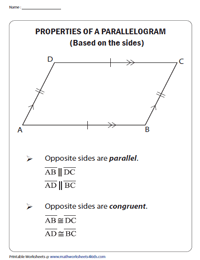 Use a ruler or check for the properties associated with parallelograms to decide. The worksheets are sorted into two sections. Learners are required to solve for 'x' in part-A and for 'x' and 'y' in part-B. Apply the appropriate properties and solve each problem to obtain the variable value. The diagonals of a parallelogram bisect each other. Apply this property, set up an equation using the measures of the diagonals given as algebraic expressions. Equate the algebraic expressions given as the measures of the opposite sides. Solve the equations and find the measure of the indicated length(s). 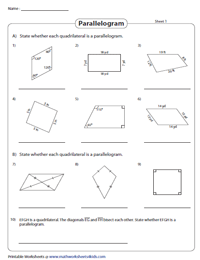 Included in this package of perimeter of parallelograms worksheets are exercises to find the perimeter of parallelograms involving integer, decimal and fractional dimensions, find the missing sides and more. 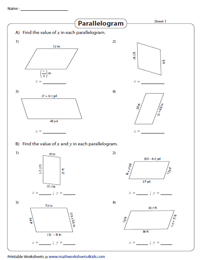 The area of parallelograms worksheets feature a variety of practice PDFs on finding the area of a parallelogram and the missing measures with attributes in integers, decimals and fractions and much more. 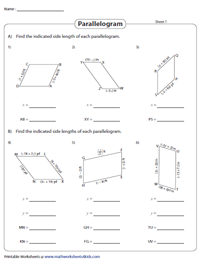 Navigate through this collection of angles in parallelograms worksheets with skills like finding the indicated angle using the vertex angle and the diagonal angle, solve for x, find the missing angle and more.